Mystro is a nascent start-up in development that is a lightweight trip planning/organizational tool to keep track of places, plan trips, and share experiences with other people. 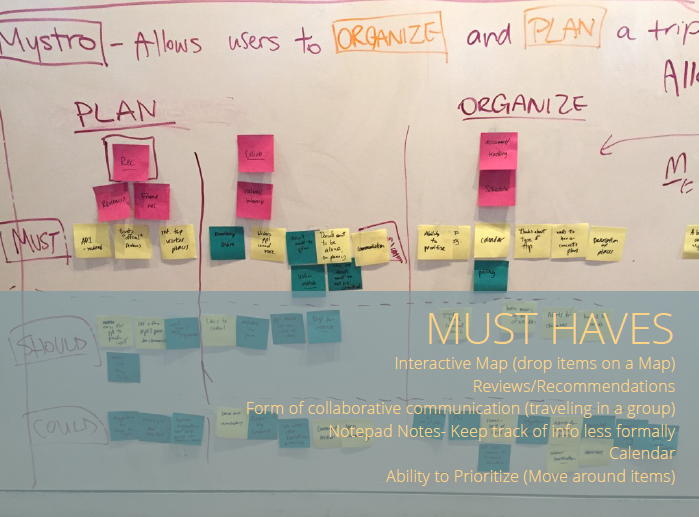 Mystro has a working desktop platform at Mystro.io, however, me and my other UX design colleagues were tasked to research and provide a better understanding of trip planning behaviors and mindsets of users. Our end goal was to design a research-based prototype that allows users to organize a trip and gather recommendations from friends. Once the project brief was clearly defined we delegated roles. I was the project manager and main point in contact for the client. I conducted comparative analysis research, initial wireframes in Sketch and early prototypes in InVision. I wrote and created the research report and presentation materials to the client. We conducted 5 usability tests asking users to do us an existing login and create a trip and add an activity they would like to do for the trip. Many users noted the orientation to be in New Haven initially and not updating when they entered a city. For example, when entering Florida the map oriented to Brazil and when one user wanted restaurants in Trinidad she received New York recommendations. Calendar required users to click through each month to get to a date rather than a scrollable option. We observed a user planning a trip in April 2017 have to go through each month in 2016 to get to their chosen date. Since Mystro is so early in development there is no defined style guide. We created a basic style guide for John to follow to better reflect hierarchy in content and give it a more clean UI. After creating a style guide we dug deeper into our research and evaluation. We conducted a competitive feature and elements analysis of seven travel sites. We found with the feature analysis that all sites but one (86%) allow for a form of collaboration and only one (Tripit) allows for easy population of information. With comparative analysis, the design team followed the same process of feature and element analysis, but went beyond just travel sites. We researched twelve sites which have the primary function of list creation (a mechanism for organization and planning) and those with the main function of collaboration. We conducted a feature analysis for list making applications and found that once logged in, the majority of sites require three clicks to accomplish the primary site function. When conducting a heuristic evaluation, the design team used 10 heuristics and evaluated each site on a 1–5 scale (5 being the strongest). We reviewed the overall usability of 6 of the top comparative and competitive sites. We found that most of the sites (4 out of 6) were communicative while the ability to control content varied across sites. We identified Evernote as a best in class for organization because of it’s light weight, ease of use and simple user interface. Citymaps’ map view gave clear location indicators and visuals of cities creating visual interest. Interviewees used 73 different type of “planning tools” ranging from travel inspiration to recommendations. From a romantic trip with a partner to a relaxing beach vacation to a cultural immersive trip in a foreign country, travelers spoke of the need to determine this to be able to make travel plans. Trips such as those for business or obligation (e.g. visit parents, friend’s wedding) were less planning focus. 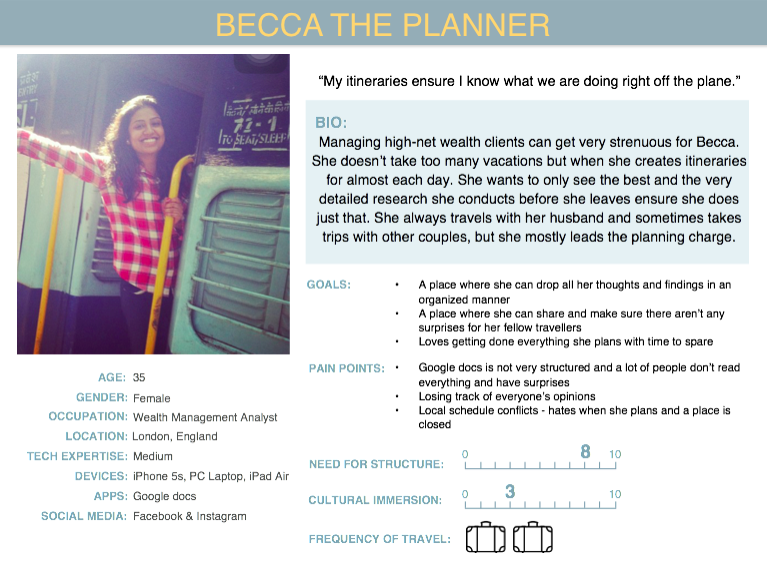 Becca is the planner and our primary persona. She enjoys having a place where she can collect her thoughts and findings in an organized manner and collaborate easily. Kenny is the companion and secondary persona. He wants to avoid touristy places and wants to get input without planning everything. Sharon is the context traveller and our additional secondary persona. She takes on many faces based on they type of travel she is taking whether it is a family trip or a foodie restaurant searching trip. We used the design charrette approach to draw out various screens. We went for a minimalistic UI keeping the focus to Mystro being a lightweight organizing, planning, and collaborating tool. We conducted over 30 usability tests and made 5 iterations. She was right. We needed to make it simpler so we made it two clicks. We found in early iterations much of the layout was unclear so we made a number of changes including clearer icons, clearer definitions (no longer my notes but my trips), and hierarchy in the content. As with any design and particularly one in such an early stage there are a number of next steps. Our end goal was to design a research-based prototype that allows users to organize a trip and gather recommendations from friends. With considerable management and defined deliverables, we were able to accomplish this. Because of the early stage of the Mystro start-up there were a number of next steps. Short term next steps are primarily continued testing of the design. Additionally, our team recommends looking closer at the market position and overall feasibility of Mystro. With the competition and various options available (e.g. the 73 different tools users called out in our research) Mystro needs a defined USP (unique selling proposition). For the long term, Mystro would need to be responsive (particularly on mobile) and the potential of booking travel through Mystro. We also recommend looking into auto population of itineraries by email and a messaging platform.